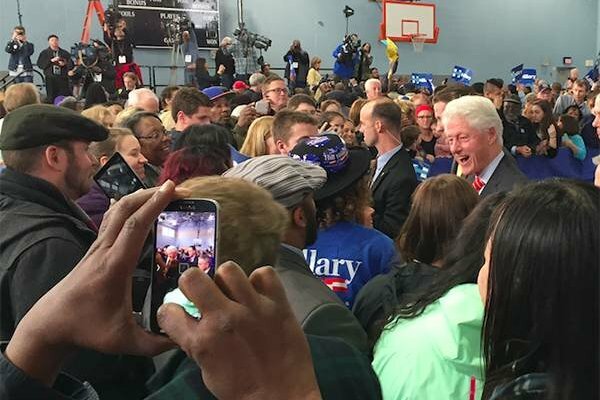 Former President Bill Clinton spoke to Hillary Clinton supporters during a rally at the Dorothy Emanuel Recreation Center in the Mount Airy section of Philadelphia on Thursday, April 7, 2016. Protesters made their voices heard during his 33-minute speech. Bill Clinton's clash with members of a Philadelphia affiliate of the Black Lives Matter movement last Thursday in Mount Airy had little effect on the favorability ratings of his wife, the Democratic presidential front-runner, according to new polling out Tuesday. Hillary Clinton's favorability ratings actually inched up in the wake of the former president's dustup with members of Coalition for REAL [Racial, Economic and Legal] Justice during a campaign stop for his wife at the Dorothy Emanuel Recreation Center, according to Morning Consult. Can Bernie Sanders translate supporters' passion into Pa. victory? In fact, Bill Clinton's favorability ratings showed a similar slight increase since the much-reported incident, which began when protesters interrupted and held up a sign that read "Black Youth Are Not Super Predators." He quickly engaged the protesters with an agitated tone to defend his actions as president and his wife's policy positions. On Friday, the former president said: "I almost want to apologize." Hillary Clinton on Sunday told CNN that she supported her husband's efforts while pledging to fix the unintended consequences of his policies. The poll indicates voters pretty much say the incident doesn't matter. Importantly for Clinton’s campaign, black voters are almost twice as likely to select her among the array of remaining presidential candidates as the person who would do most to promote racial equality. As with Obama’s two previous successful bids for president, African American voters will be crucial to a Clinton path to the White House in November. Morning Consult said Hillary Clinton’s favorability ranking, which has hovered around 40 percent, is now at 43 percent, according to a nationwide poll of registered voters taken over the weekend. The polling began a day after Bill Clinton's remarks in Philadelphia. Early last week, Clinton’s favorability rating was 41 percent. The polling on Black Lives Matter was conducted April 8-11 among a national sample of 2,040 registered voters, with a margin of error of plus or minus 2 percentage points. To read more on the poll, go to the Morning Consult report.